Extra! Tobacco Factory Fire! Henrico County Jail Evacuated! | slate river ramblings . . . . Extra! Tobacco Factory Fire! Henrico County Jail Evacuated! 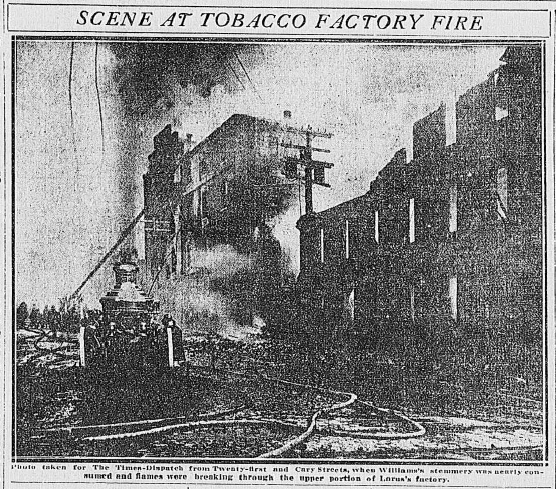 Williams’s Tobacco Stemmery Consumed in Spectacular Fire. Fireman Overcome, but Serious Injury Is Averted. Part of the burned buildings adjoin, in almost actual contact, the Henrico county jail, which soon became surcharged with suffocating smoke. Sheriff L. H. Kepm called on the city police force to aid him in removing the prisoners to a place of safety. . . thirty-three prisoners, among them being three men convicted of murder, brought here from Buckingham county, were transported to the City Jail. Fireman fought to prevent the fire from spreading to the jail and courthouse. What more could happen to these men? Flood? A plague of locusts?